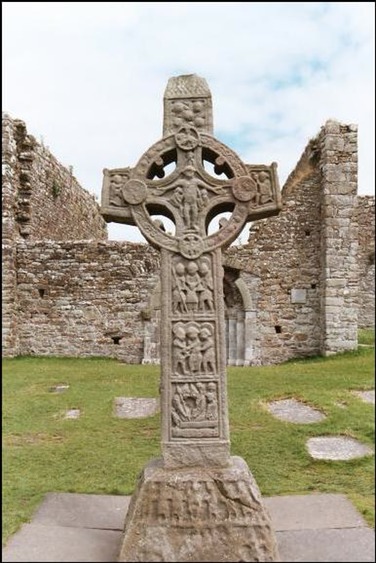 On this page you will find a description of the imagery on the West Face and the East Face of the Scripture Cross at Clonmacnois. Following this is a brief description of the Site and its History. 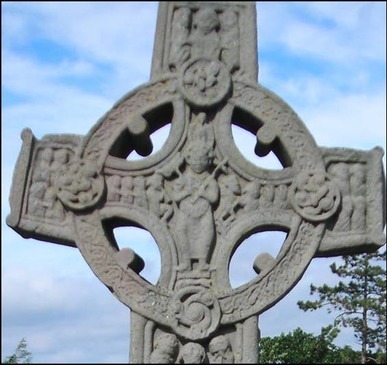 The Scripture Cross at Clonmacnois is one of the outstanding Irish High crosses. It was carved and erected by Abbot Colman in honor of King Flann, who died in 914 CE. We know this from an inscription on the cross itself. The Scripture Cross is a prime example of a genre of crosses that depict biblical scenes, the scripture crosses. In the photo above we are looking east and see the cathedral in the background. Begun in 909, the ruins are mostly 12th century. The top or cap of the cross [to the right] is in the shape of a gable roof with shingles. 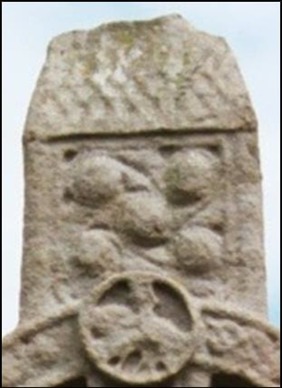 This is one of the common conventions used for the tops of the Irish High Crosses. In the panel below the cap, are five interlinked bosses. The curving lines that connect them are typical of what is known as Insular Art, the early art of what is often referred to as the British Isles. In the ring, lower left and upper right we have animal interlace, though it is difficult to decipher in this photo. Upper left and lower right we have bosses linked in S-shapes which tie in with the upper panel above. There are other interesting features in this scene. 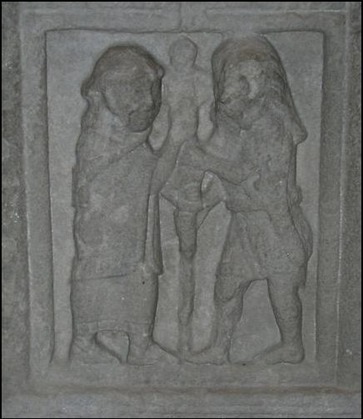 The figures to the left and right of Jesus are traditionally identified as Stephaton (left), who offers Jesus vinegar on a pole and Longinus (right) who stabs Jesus with a lance. Stephaton and Longinus appear in the passion story in the Gospel of John 19:28-34. There is also a small figure just above Jesus’ head. It is often identified as an angel. It probably symbolizes the presence of God with Jesus as he suffers on the cross. We now move to the shaft of the cross. Scholars differ on the interpretation of the top scene [to the right]. 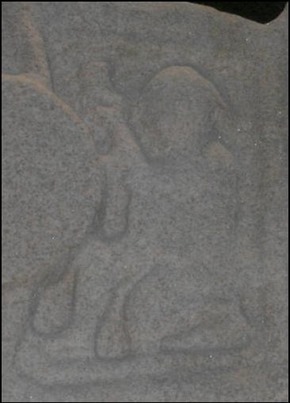 The key issue is the identification of the center figure. If understood as Jesus, the scene might be Christ on the way to the cross, his arrest, mocking, betrayal or flagellation. This panel reminds us of the difficulty of interpretation of the biblical scenes on the crosses. Some are very clear while others are more obtuse. 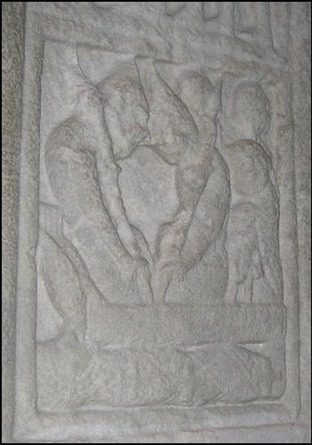 Moving down the shaft, this scene is generally recognized as either the arrest or flagellation of Jesus. 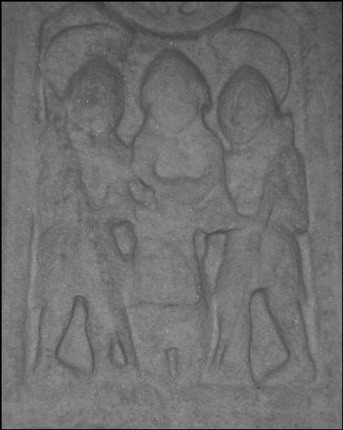 Two soldiers are seen to hold Jesus. As in the previous scene, the apparent halos on the two flanking soldiers are interpreted as helmets, though the halo above Jesus’ head is identical and interpreted as a halo. Most interestingly, there is a bird just above Jesus’ head lower left. It appears to have its beak in Jesus mouth. This could represent the Holy Spirit about to breath life back into Jesus. What we see here may represent the last moment before the resurrection. In the photo to the left, we are looking west toward the modern visitor center and museum. 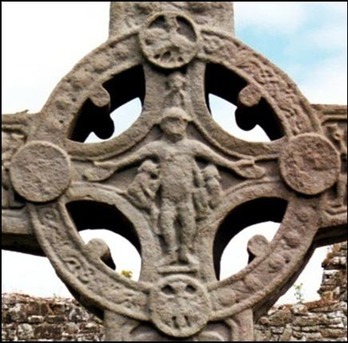 The originals of the Clonmacnois High Crosses are located there. 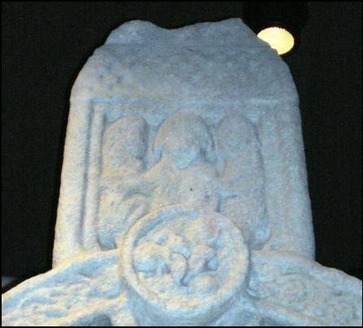 The cross in the photo is a replica placed in the location of the original. 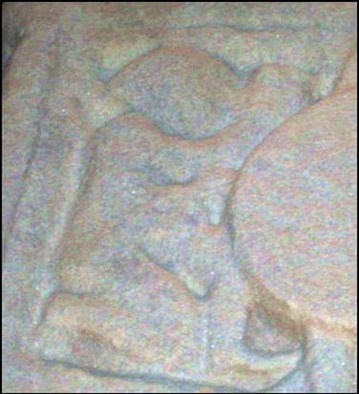 The photos below, with one obvious exception, were taken of the original cross. Having a High Cross of quality was a clear sign of the wealth of a monastery. The creation of these crosses in the early years may have been in response to Viking raids. While smaller silver or gold crosses and other fixtures were easily removed, the High Crosses had no value to the Vikings and were not easily movable at any rate. Clonmacnois was plundered five times in the 9th century, once by the King of Cashel. During the 10th century the monastery was plundered at least nine more times. (MacGowan, 7-9) Given this history it is amazing that the two primary High Crosses were not damaged and that the monastery continued to flourish for 1000 years. Scholars do not all agree on the identification of the scene at the top of the east face of the cross. In either event, Christ and the Gospels are represented in the image [above], perhaps Christ as Risen Lord. This image is a composite, not related to any specific biblical text. There may be some relation to the Judgment of the Nations in Matthew 25:31ff. Another possible connection may be with story of the Messages of the Three Angels in Revelation 14:6ff. Mostly it reflects an image the early church had come to associate with the Last Judgment. The interpretations of this scene [to the right] are varied. They include the Arrest of Jesus [Mt. 26:47f; Mk. 14:53f; Lk. 22:66f; Jn 18:12f], the Mission to the Apostles [Mt. 10:1f; Mk. 6:6f; Lk. 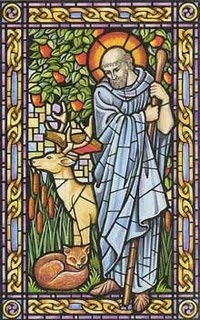 9:1f], and the story of the Loaves and Fishes [Mt. 14:13f; Mk. 6:30f; Lk. 9:10f; Jn. 6:1f]. From time to time a scene on a Scripture Cross will be given a contemporary (10th century) meaning. One interpretation of this scene is Odo rebuilding the church of Saint Kieran. 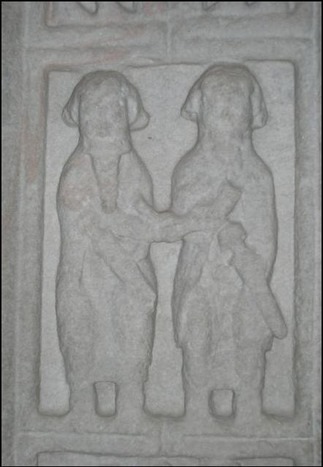 In this scene [to the left] we have two figures, both clearly secular as they wear swords. The scene has been given a variety of interpretations that reflect the history of the area from the foundation of the monastery there to the time of the erection of the cross. 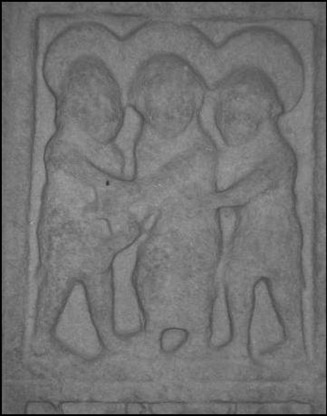 For example, “conclusion of a pact between Flann Sinna and Cathal mac Conchobair, king of Connacht.” (Harbison 1992, 49) Flann was high king at Tara during the time of the erection of the Scripture Cross. An appealing contemporary interpretation sees the figures as Stain Kieran on the left and King Diarmuid founding the monastery. 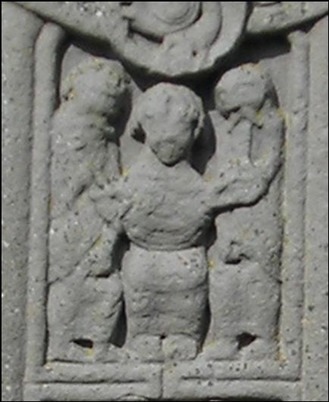 Diarmait mac Cerbaill was High King at Tara when Clonmacnois was founded. Reflection on the Iconographic Program: It may be possible, in some cases, to read the images on a scripture cross as representing one iconographic whole. 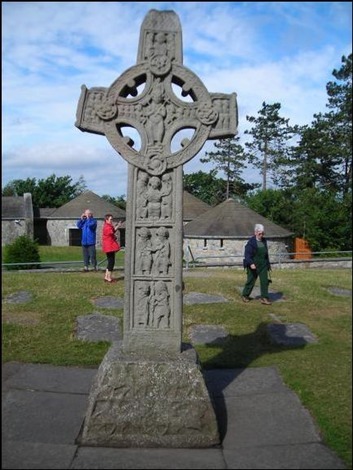 It has been suggested that the theme of the west face of the Scripture Cross at Clonmacnois is the Passion Week. Theologically this is the pivotal event in God’s action for salvation. We have, from top down, the crucifixion, the soldiers dividing Jesus' garments, the arrest or flagellation and at the bottom Jesus in the tomb. It is possible to read the east face of the Scripture Cross as continuing the theme of salvation. Reading from the top down, we have the Risen Christ, the agent of salvation; Christ and the Last Judgment, with some saved and some cast out; the Church in the persons of Peter and John being given the keys to the kingdom and the gospels, the temporal power of salvation; and, seeing Joseph as prefiguring Christ, God’s historic and ongoing work for salvation. This latter is related to the Last Judgment in that while Pharaoh’s baker is not shown in the lower two panels, those knowing the story would know that while the cup-bearer was restored, the baker was beheaded. In addition, both panels have to do with the events that led to the release of Joseph from prison and his eventual rise to power in Egypt under Pharaoh. It is significant that Joseph’s interpretation of the butler’s dream was fulfilled on the third day, even as Jesus was raised on the third day. Sources: Textual information about Clonmacnoise comes from the Irish Chronicles and from the Saints Lives. Because the chronicles are generally accepted as reliable only from the late 6th century, the exact date of the founding of Clonmacnoise is uncertain. In all probability Ciaran founded his monastery between 544 and 548 CE. 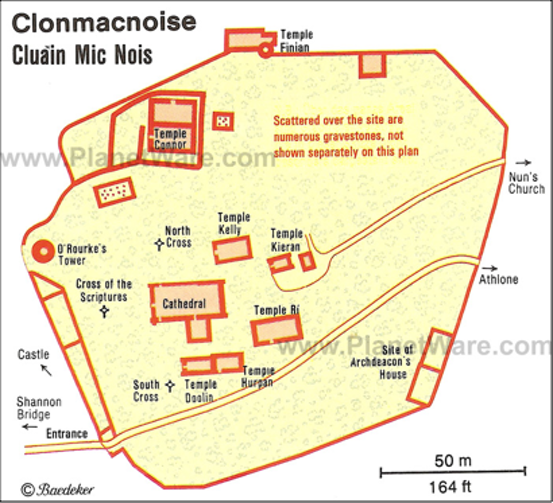 Location: The selection of the site for Clonmacnoise contributed to its success. Clonmacnoise was built at the strategic intersection of the River Shannon and the Sli Mhor (Great Road). The River Shannon is the longest river in Ireland and runs north/south. The Sli Mhor is an esker that crosses the Irish midlands east/west. An esker is a long narrow ridge composed of sediment laid down by a glacial tunnel. Around the site, making it almost an island are the Shannon Callows (a river meadow submerged during flooding), the Mongan Bog and the River Shannon. It was also sited on the boundary between the kingdoms of Connacht and Mide or Meath. In the early centuries all buildings were constructed of wood or wattle. The earliest of the present stone buildings Temple Doulin dates from the 9th century. The Cathedral dates from the 10th century though it was altered or restored numerous times. Most of the other buildings were built in the 11th and 12th centuries. The three High Crosses are relatively early. The South Cross dates from the 8th century; the North Cross from the 9th and the Cross of the Scriptures from the early 10th. Earle, Mary & Maddox, Sylvia, Holy Companions: Spiritual Practices from the Celtic Saints, Morehouse Publishing, London, 2004. MacGowan, Kenneth, Clonmacnois, KAMAC Publications, Dublin 1998. 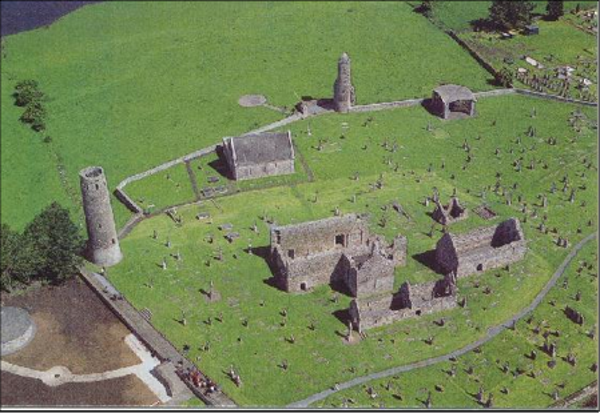 The Monastic City of Clonmacnoise and its Cultural Landscape, Management Plan 2009-2014, prepared by The Office of Public Works and Environment, Heritage and Local Government, 2009.
newadvent.org; Abbey and School of Clonmacnoise; Catholic Encyclopedia. Veelenturf, Kees, 1997. Dia Bratha: Eschatological Theophanies and Irish High Crosses, Stichting Amsterdamse Historische Reeks.